EXAIR’s new Gen4 Super Ion Air Wipe provides a uniform 360 degree ionized airstream that clamps around a continuously moving part to eliminate static electricity and contaminants. It is ideal for removing dust, particulates and personnel shocks on pipe, cable, extruded shapes, hose, wire and more. This engineered product has undergone independent laboratory tests to certify it meets the rigorous safety, health and environmental standards of the USA, European Union and Canada that are required to attain the CE and UL marks. It is also RoHS compliant. New design features include a metal armored high voltage cable to protect against abrasion and cuts, a replaceable emitter point, integrated ground connection and electromagnetic shielding. The Super Ion Air Wipe, which compliments EXAIR’s complete line of Gen4 Static Eliminators, has an aluminum construction that is lightweight and easy to mount using the tapped holes provided. Two sizes include a 2 inch (51mm) diameter and a 4 inch (102mm). There are no moving parts to wear out. 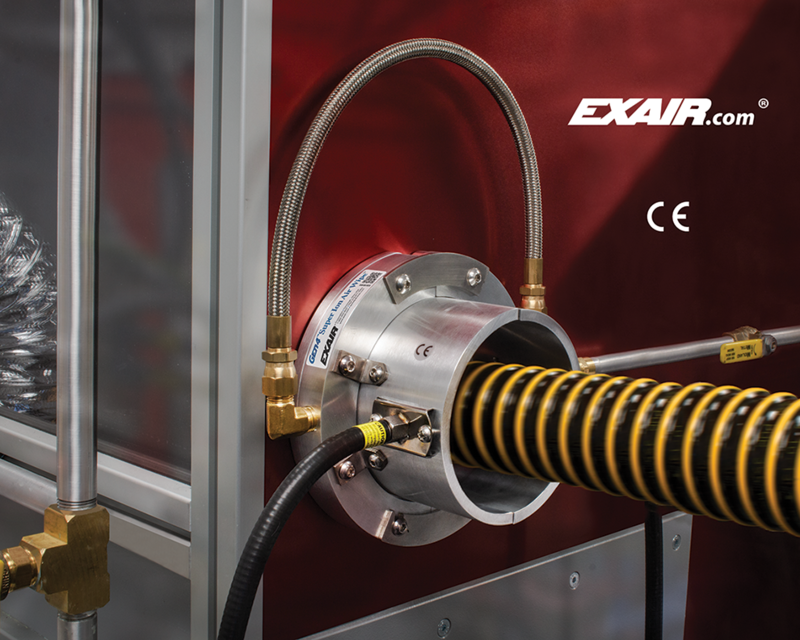 Visit EXAIR.com to see the entire Gen4 Static Eliminator product line and 1/2 inch through 11 inch Super Air Wipes for applications without static. Prices start at $957.